Endovascular aneurysm repair has become a very appealing strategy in the treatment of abdominal and thoracic aortic aneurysms. This minimally invasive approach is of particular benefit in patients with co-morbidity who would be at increased risk for conventional surgery. 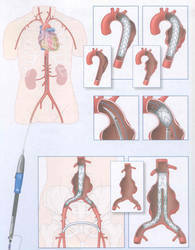 The technique is also applied in patients with aortic dissection or dissections of large aortic side branches. Careful preoperative patient screening is mandatory to optimize patient outcome. The technique allows, thanks to its minimally invasive nature, a complete and long-lasting therapy together with an almost immediate postoperative ambulation. As such, we have adapted this technique routinely in our department and have performed more than 300 procedures so far.